On this one day in September, Melbourne will be gripped with AFL Grand Final fever with the two grand finalists’ team colours spread throughout the city. When you hire our twin bowl or triple bowl package you will receive over $50 OFF. 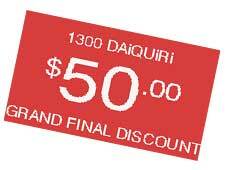 Book your daiquiri machine now in the colours and flavors of your team and get $50 off the total price when you hire a twin or triple bowl machine package.